CTET Answer Key 2018 Paper 2 Set M – CBSE has uploaded CTET Official Answer Key 2018 for Set M. The Board released it online, through login. With the answer key, the OMR has also been released. Candidates can refer the answer key to cross-check the answers. With the help of the CTET Answer Key 2018 Paper 2 Set M, the candidates can verify their answers and can estimate their scores. Also, they can have the idea of qualifying the exam. The CTET Result 2018 will be available for check 6 weeks after the exam date. Check complete details about the CTET Answer Key 2018 Paper 2 Set M from this page. Latest: CTET Official Answer Key 2018 for Set M and OMR for Set M released, Get it from below. Official answer key of CTET 2018 has been released at the official website. Along with answer key candidates can also download the OMR sheet. And candidates can also place the objections if required. Candidates can challenge it by paying Rs. 1000 per objection. 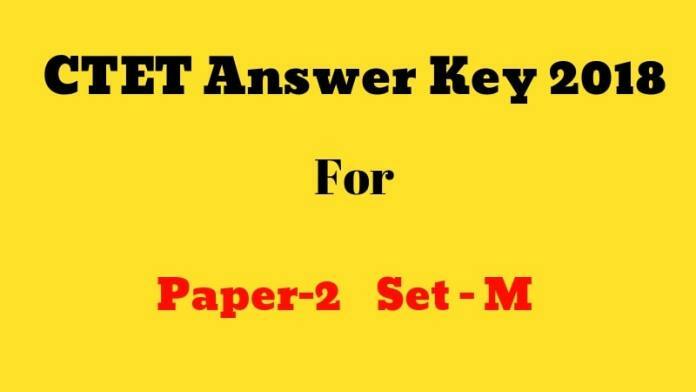 CTET Answer Key 2018 Paper 2 Set M – How to Download? Visit the CBSE CTET official website ie, ctet.nic.in. CTET official page will appear. Scroll the page and click on the link Answer Key for CTET 2018. CTET 2018 Answer Key page will appear. Check the Paper 2 box for the key. Click on the link for Set M.
Answer key will open in new tab. Check the key or download the same. After obtaining the CTET Answer Key 2018 Paper 2 Set M begin the process of verifying the answer that you have attempted. Before verifying the answer it is also important that the candidates should be aware of the Exam pattern and Marking scheme. It is very important to know the marking scheme for the calculation of the marks. Check CTET 2018 Pattern and Marking Scheme. Before calculating the marks make sure you are aware of marking scheme. For correct answer 1 Marks is awarded. There is no negative marking so 0 marks are awarded for the wrong answer. While calculating the marks subtract the wrong answer from the totally correct answer. Check the formula for marks calculation. The purpose of releasing the answer key is to verify the attempted questions and also to calculate the estimated marks. CTET aspirants can find it useful while preparing for the exam in future. It will help them in verifying the answer during the preparation. Central Board of Secondary Education will declare the result at ctet.nic.in. Candidates will be able to check the marks and status of qualifying the exam. The roll number is required for checking the result. Candidates will be able to check the marks obtained in each subject. The candidate qualifying the exam and score the cutoff marks will be eligible to teach in classes 6 to 10. Central Teaching Eligibility Test (CTET) is conducted by Central Board of Secondary Education. The candidate who wishes to teach in class 1 to 5 and 6 to 10 have to appear for the eligibility test. CTET is conducted for two paper Paper -I and Paper -II. Paper I is conducted for class 1 to 5 and Paper II for class 6 to 10. To qualify the exam candidates to have to score 60% marks. The exam is conducted for 150 MCQ questions in pen paper mode (offline mode). When you don’t know the answers? Why you have published wrong answers? Don’t match from it…..mpst of the answers are wrong in it..